Few things are as appealing as a gourmet coffee gift basket. For many coffee lovers, coffee has become much more than a morning eye-opener. Many companies offer beautiful collections of gift baskets but you can opt to buy monthly subscriptions to coffee clubs as well. The contents of the gift basket are of the utmost importance and while coffee is a key component, the addition of biscotti, chocolate, or various coffe syrups can complete the presentation. Preassembled baskets often follow themes to help customers narrow down the search. Collections meet all price points and coffee can be a foundation for an affordable gourmet basket. Good coffee is the heart of the presentation and many wonderful options are available, whether the recipient loves flavored selections or traditional brew that embraces the natural flavor of the coffee. Gourmet baskets may include samplers that allow the recipient to experience a number of different coffee selections. Single origin beans are ideal for a coffee connoisseur. These beans come from specific growing regions. Hawaiian Kona is a popular example of coffee beans that come from a single growing region. Organic coffee is cultivated without manufactured chemicals and farmers use methods that preserve the soil. Many organic coffees are also grown in shaded forests (shade grown), which provides a natural habitat for birds and other wildlife. Arabica beans are flavorful and are favored over Robusta beans. Themed presentations are wonderful, whether you select a winter warmer or a prized collection of coffees that will impress the most experienced barista. Coffee gifts are wonderful options that have many different facets. You can find beautiful packages for a special occasion or you can buy a subscription to a monthly coffee club. The appeal of the gift basket is its creative presentation. The gift is visually appealing and the container serves as a warm reminder of the thoughtful present. Many online stores offer gift baskets that suit nearly every budget. Nectar of Life has many affordable options in clever displays, including gift baskets shaped like coffee mugs. The site features baskets containing whole bean or ground coffees and customers may choose decaffeinated coffee. Great Arrivals has stunning selections that pair sweet treats, truffles and fine cookies with its coffees. Wine Country Gift Baskets features coffee gifts for fans of Starbucks coffee shops. Presents include containers filled with the famous brand as well as Tazo tea. Design It Yourself is a wonderful option that allows customers to create their own presentation. The custom gift baskets take three simple steps to build, beginning with size and budget. In addition, customers may select from a number of standard gift baskets. If you are considering a gourmet coffee gift basket, you may want to explore coffee of the month clubs. Examples of companies that offer monthly subscriptions are Citizen Bean and Igourmet.com. Citizen Bean approaches coffee as a wine aficionado approaches wine, with the attitude that there is no single best coffee. Each month, the company selects the finest coffees from small roasters in the United States. Citizen Bean practices fair-trade and exclusively selects organic, shade-grown coffee. Igourmet.com features a coffee of the month club that includes single origin coffees, regional blends and custom blends. Occasionally, the company features organic and fair trade coffees. Customers may select a yearlong subscription, a six-month plan or a three-month plan for their recipients. 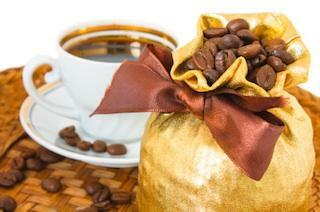 Gourmet coffee gift baskets are excellent selections that allow you to be creative. Clubs, themed presentations and custom creations are among the many choices available that can help you build a memorable present.